In a heavy cooker, combine the sugar, butter, evaporated milk, pumpkin pie mix and pumpkin pie spice. Using medium heat, bring the mixture to a full boil, stirring continuously to prevent sticking and scorching. Use a candy thermometer to allow the mixture to reach 234 degrees. This should take approximately 10 minutes. Remove the cooker from the heat and stir in the butterscotch morsels and allow them to melt. Next add the marshmallow creme, almonds and vanilla and stir until well blended. Quickly pour the mixture into a 13×9 pan that has been buttered or greased and spread until smooth. Allow the fudge to completely cool at room temperature before cutting. 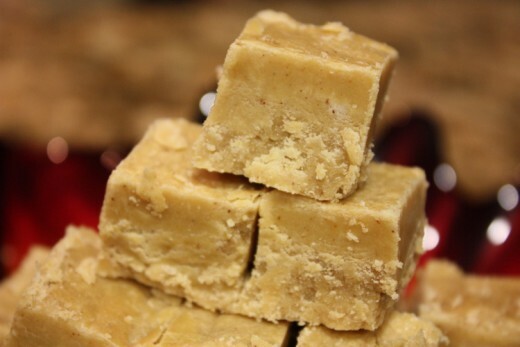 Fudge can be stored in the refrigerator tightly wrapped in plastic, foil or placed in food storage bags. In a large bowl, combine the pumpkin, vegetable oil, sugar, eggs and water and beat until the ingredients are thoroughly mixed. Combine all of the other ingredients into a separate bowl and mix well. Add the dry mixture into the pumpkin mix a little at a time, mixing well. When all the mixtures are combined, beat the mix until it has a smooth consistency. Grease 2, 9×5 loaf pans and lightly dust them with flour. Divide the mixture and pour it into the pans. Bake for about an hour, or until a toothpick can be inserted into the thickest area and comes out clean. 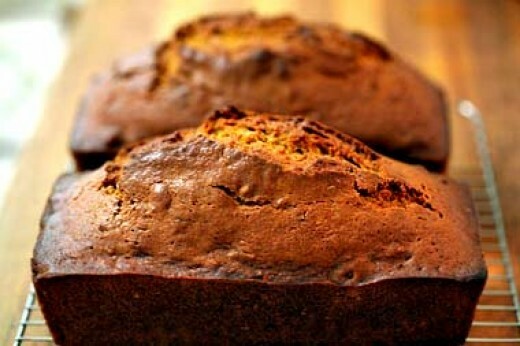 Pumpkin bread is delicious plain, but you can top it with butter or cream cheese for a extra treat!